The B&G Shed range is perfect for those who prefer the cleaner, more attractive design of a galvanized portal frame (clear span) building. The building frame is constructed from galvanised steel "C-Section" members with galvanised purlins and girts to the roof and walls. There are no trusses, knee braces and apex ties, so there is extra clearance height inside the building to provide you with more room. The C-section columns and rafters of the frame are generally bigger and heavier than most other C-section frames. The B&G Shed is designed to be fixed directly onto a structural concrete slab, however, if required, the building can be supplied for fixing to pad foundations with the option of pouring a concrete floor at a later stage. The Portal Frame has large bolted Haunch and Apex brackets using 12mm or 16 mm Zinc plated bolts. The base bracket is also bolted to the frame with 12mm or 16 mm Zinc plated bolts, and held down with 2 x 12mm or 16mm Dynabolts. Each frame is braced to the top hats with flybraces which stop any twist in the frame and dramatically increase the frame strength. Any length, width or height -not just the standards. Computerized material takeoff for increased accuracy and flexibility. Heavy duty C section, fully bolted, all galvanized portal frame. All buildings include certified plans and computations to ensure speedy Building Permit approval. All BHP materials to the frame and cladding, manufactured by Bluescope Steel. Skylights – in polycarbonate or 2400g fibreglass. Kit buildings include all components required to construct the building ordered, including all Trubolts or Chemsets, brackets, bolts and screws. All buildings include Squareline gutters, matching Squareline gable barge capping and 100 x 50 rectangular downpipes to ground level. Double Rolladoors feature a fixed centre mullion. A removable centre mullion is available at an extra cost. Colorbond screws to fix all Colorbond sheets and flashings. Heavier C150 eaves purlin – not top hat. Wall and roof bracing is standard to all garages and sheds. Fly bracing to all portal frames – increases frame strength. Rolladoors, Panelift or Sliding Doors. Garaports, Verandahs, Open Bays and Dividing Walls. Sliding windows, Glass sliding doors in a range of sizes. Headbeams to remove the column between sliding doors. Lifting lugs to suit chain block and tackle. Available in a range of roof pitches from 10 deg to 30 deg. Full range of Zincalume and 22 BHP colours. Multiple colours -mix and match at no extra cost. Factory Finish (Trimdek or Corrugated 0.47mm) cladding upgrade to enhance larger buildings. Includes full set of delivery documentation with slab plans, flashing drawings and purlin detail sheets. Fully detailed easy to follow erection instructions -all step by step with pictures. All components are drawn. Lots of sectional details. Telephone support is always available from our experienced in-house experts. Our specialised contractors are well trained and are completely experienced in the work they carry out. The building contractor warranties their work for 12 months after completion. 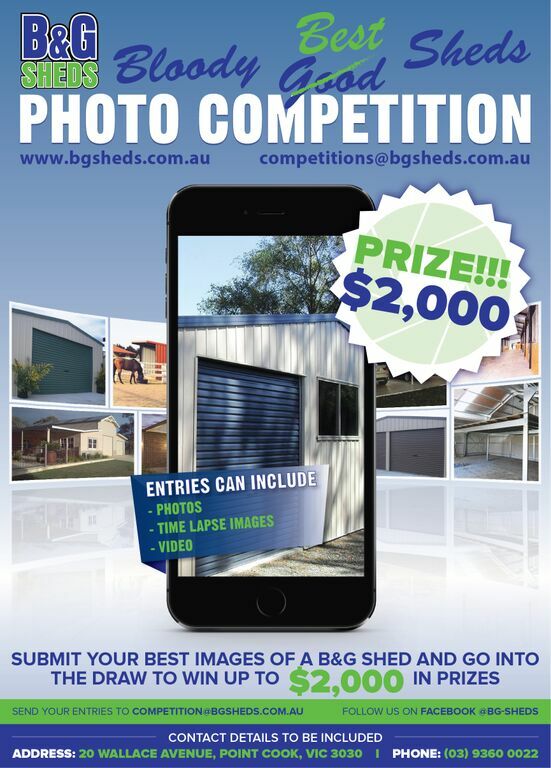 B&G Sheds also warranties all work performed by the building contractor. The building contractors are Licensed Roofing Plumbers for Class 10a buildings.